This shot looks toward the passenger-side rear. What you see just above the jackstands is the last PITA bolt holding the lower control-arm in place. The nut came off fine with the huge impact wrench (didn't budge with any length of cheater-bar), but the bolt would not move. The wet stuff is rust-dissolving lubricant, which I used generously and repeatedly all over back there. The wooden handle you see below the axle is part of a 10-pound sledgehammer I was using to try to budge the fused bolt. To no avail. After using a 1000-lb/ft air-impact wrench to remove the nut, I tried to push the bolt through the control-arm bushing. The 3/4" head of the bolt sits on the other side of the framerail just beyond the control-arm mount, and you can access it through a hole in the frame. It's not centered, and it's tough to shine light in there, but with some patience you can slip an impact socket over the head; be sure to attach an impact extension to the socket first, or you'll be fishing around inside the frame for the fallen socket. It's a pain, but a pen-magnet will make retrieval simpler. The impact wrench did nothing. Seriously. Liberal doses of PB Blaster, widely considered the best penetrating lubricant. I continued to apply more all the way to the last step. 1000-lb/ft-torque air-impact wrench. Didn't turn. 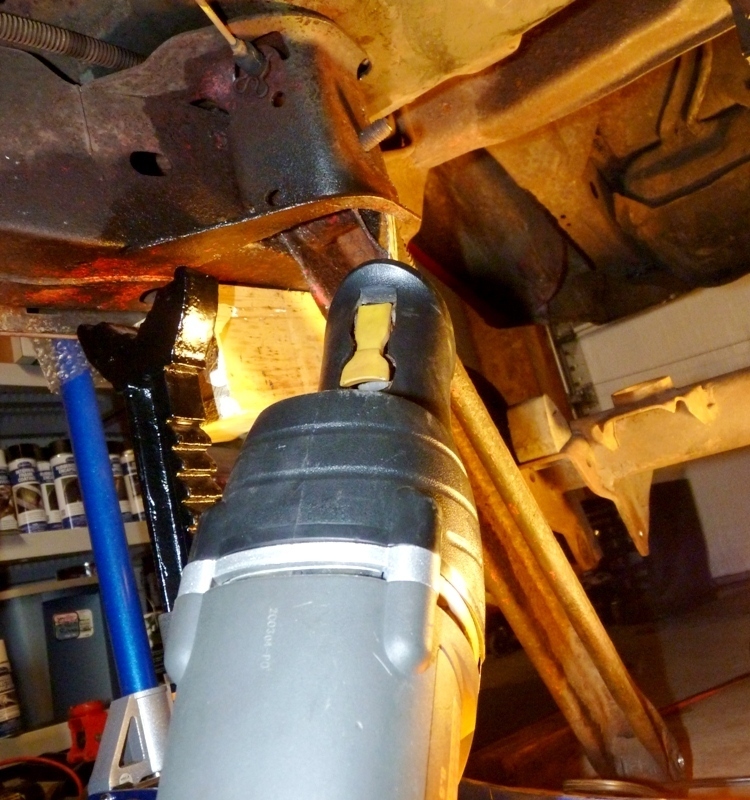 10-lb sledge-hammer against the end of the bolt, under the car. Didn't move at all. 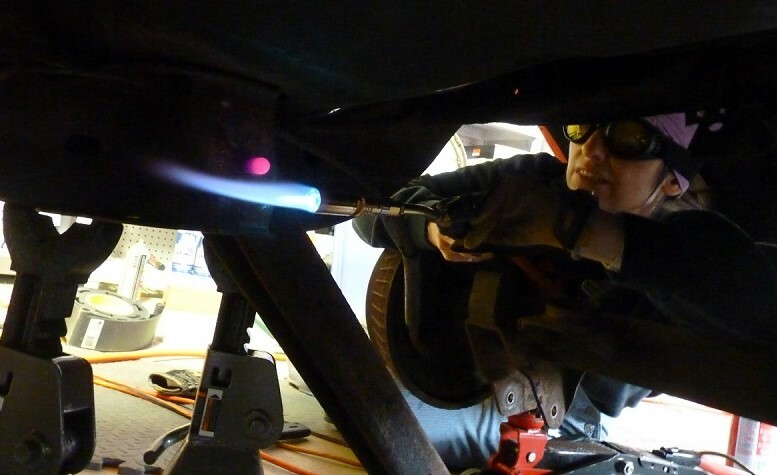 Heating the bolt. We got the thing glowing red, but that made no difference at all (see photo of Clevermanka with a torch, below). Air-hammer. I beat the hell out of the end of the bolt, trying to push it through. Sawzalling through both sides of the stuck bolt. This approach worked! I'll describe the process of what worked, because I can't find any tutorials anywhere on the internet, even though this is a common problem. Get a friend to help. 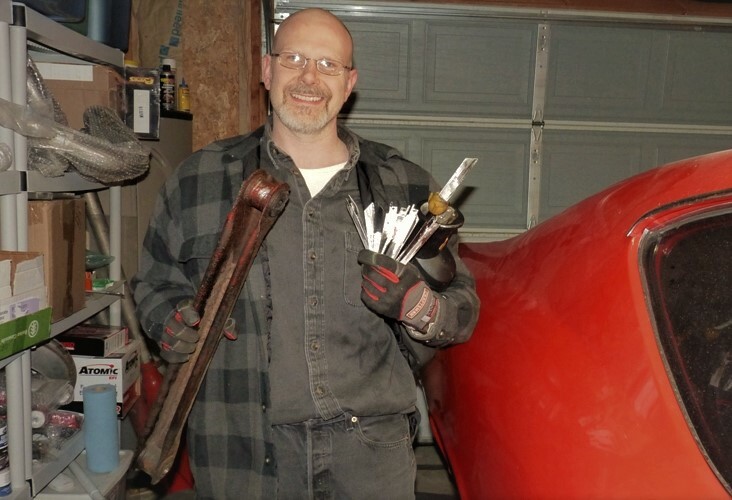 Not only is it handy to have someone handing you tools while you're in a cramped position under the car, it's nice to know someone can help get the car off you should it fall... or at least call an ambulance. Place wheel-chocks on both sides of both front wheels when lifting the rear. You don't want it rolling while you're under it. 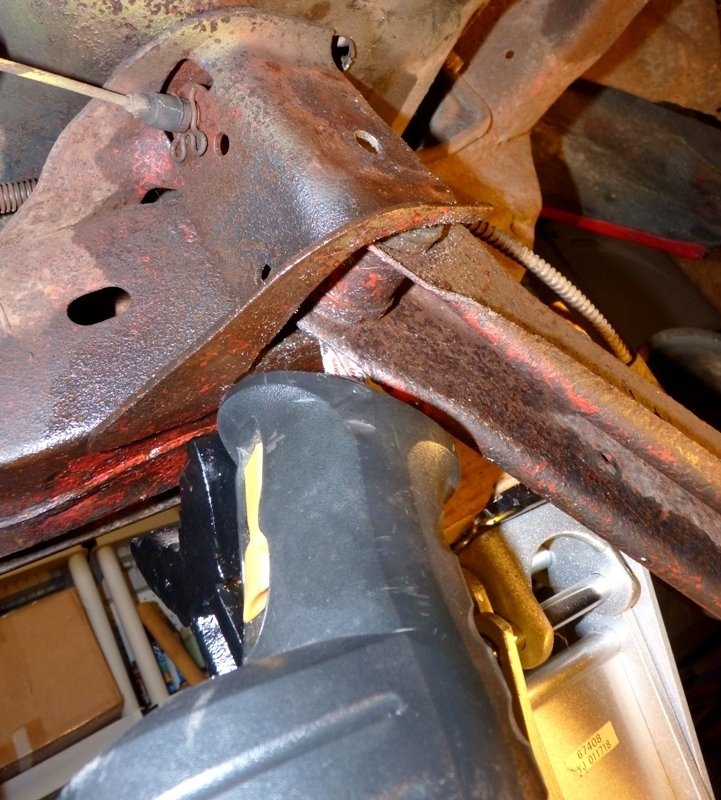 Prepare jackstands (I use two per side) to insert under solid spots of the frame. Wear safety goggles. These need to keep rust, dirt, and metal shavings from falling into your eyes AND be able to stop something like a broken blade from penetrating your eyewear. Wear ear-protection whenever using power tools, especially in a confined space like beneath a car or simply in a garage. It gets LOUD and can cause hearing damage. Wear protective gloves made for this kind of work. 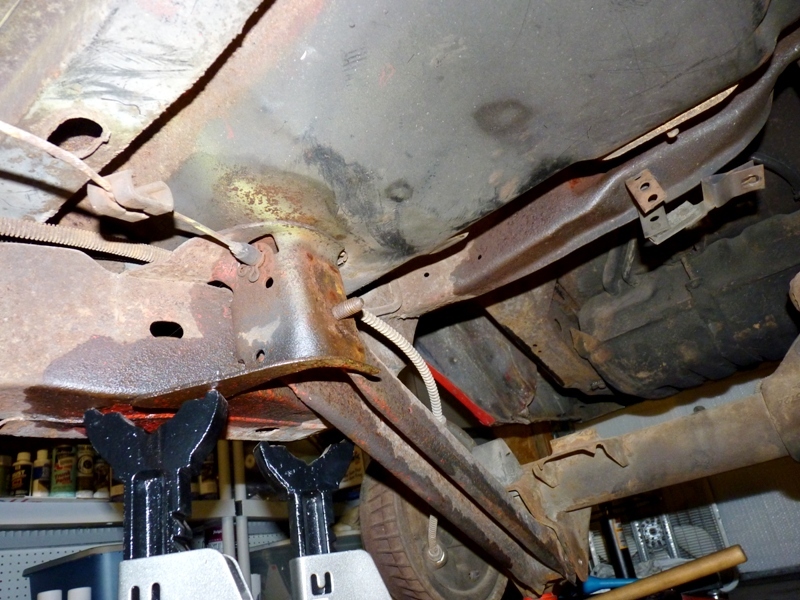 After jacking up the car to a workable height (for me, that was high enough that I could place the Sawzall on the garage floor with the blade positioned properly), place the jackstands under solid jacking-points on the frame. Test them to make sure they're solid. Some people prefer to lower the car from the hydraulic jack at this time, but as long as they're well-positioned, you're good. Just don't knock them out of place. Position lighting so you can see what you're doing. I placed some of those interlocking anti-fatigue mats on the garage floor. This goes a long way toward keeping you from freezing to death in the winter and also from banging your head, elbows, and so forth against the cement... especially when doing frustrating work. Before cutting, open the garage door and a window or door on the opposite end of the garage. Set up a box-fan beside you to blow toxic fumes away and outside. If you're still worried, wear a respirator. Step 1: Set up as described in the safety notes, above. Step 3: Generously lube the bolt and blade before you get started cutting. Do this after each time you use up a blade; it helps cool the blade, making it last longer, and makes the cut go faster. 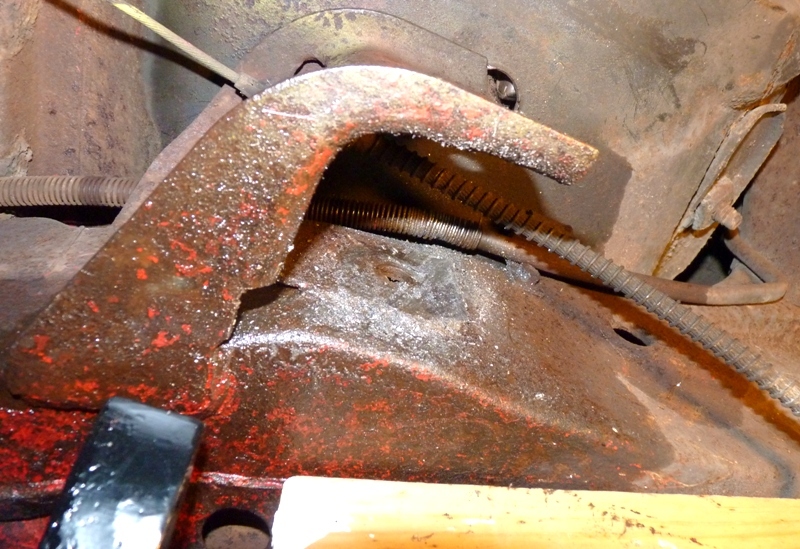 Place the blade between the frame-ear where the bolt passes through under the car and the rubber of the bushing. Wiggle it into position as best you can; I found that compressing the rubber by pushing the control-arm over with a pry-bar helped open the space a bit. Rest the handle end of the saw against the floor for added stability while placing one hand against the outside-top of the saw (blade end) and the other hand holding the handle in place below. Be careful to keep your hands away from the blades and also from getting smashed under the saw as it tries to jump around. Cut through the bolt. This step used up only two blades in my attempt, probably because the threaded end is both thinner and more fatigued. Don't push too hard, because you could lose control and hurt yourself, and also because it just wears out the blade faster. This side of the bolt (closest the framerail) is less exposed to the elements, thus less fatigued. This side of the bolt isn't threaded, thus thicker. The blade rubs against the frame-side of the mount, so it tries to cut that, too, or at least rubs there a lot. Step 8: Clean up the frame if you end up with a lot of burrs, like I did. Otherwise you'll damage your new control-arm or bushing later. I hope that helps! Good luck, and drop me a note if you found this useful or have some added suggestions. Next: Unboxing the new Moser 12-bolt rear end and Tremec T-56 Magnum 6-speed transmission!